The Working Couple Life | A journey into the professional property caretaker lifestyle. Time truly does fly when you’re having fun. We celebrated our 1-year anniversary here at Silk Cotton Villa back on 21 July 15. And we’re close to wrapping up our commitment to the owners as caretakers and hosts. Sadly, we depart 07 Aug and head back to Blue Ridge, GA.
Back in December ’14, after 5 months as caretakers, the owners asked us to stay on for another year. We were surprised they asked so soon but were grateful they liked us and our work. They wanted an answer by mid-Jan because if we did not accept, the next caretakers (runners-up to us last year) they were considering to hire needed some time to get their affairs in order. The renters of our home could not commit to another year back in January so Sharon and I decided it was best to decline the owner’s invitation and get back to Georgia to put our home on the real estate market. We want to continue this lifestyle into the future unencumbered with a home and all that goes with one. In hindsight, we probably should have asked the owners if they would allow us August and September off-island to go back to Georgia and get the home on the market. Plus, we have a wedding to attend in late September we will not miss. Like the old saying goes, “Hindsight is 20/20.” But no regrets. Things usually work out for us in a good way. We welcomed our last group of guests yesterday – a full villa here for a small wedding and reception that will take place next week in the villa. The owners return 31 July for their usual late summer stay and to also welcome the new caretakers who will arrive 01 Aug. The owners asked us months ago if we would stay for a week after the arrival of the next caretakers and train them. The owners trained us. We are honored they think enough of us and our work to be in charge of training the newbies. This has been one of the most exciting, interesting, and enjoyable years for Sharon and I. We were both a little nervous and apprehensive when we accepted the position. But it was nothing more than not knowing all the details of a new place and new job. And it all worked out perfectly. A great experience. We met so many nice people here and made many life-long friends, too. If you’re a regular reader of this blog, you’ve seen some of these friends in photos we have posted. Below we posted a few more. We will truly miss these folks and hope to see them again soon. We made some great, lasting memories. Scott and Carol, the owners, could not have been any more accommodating and welcoming from the first time we met them. We have met numerous other villa caretakers and property managers during our stay here on St Thomas and we know that every owner is not as nice, kind, and easy to work with as Carol and Scott. We definitely hooked up with one of the best villa owner teams on the island. Oh, and if you decide to book Silk Cotton Villa, remember to tell Carol that Richard and Sharon sent ya … you might get the “good buddy” discount. They have become life-long friends, too. They are a lot like Sharon and I in many ways; they love each other greatly, they love working together, and they enjoy their down time together. They have been wonderful to work with and who knows, we may work with them again someday. Two weeks from yesterday will be a sad moment but who knows what adventure is around the corner for Sharon and I. Stayed tuned. And keep smiling! This entry was posted in Uncategorized on July 25, 2015 by Richard Arnold. Last weekend, while the owners were here with their family for a week, they allowed us to get away for a long weekend of some R&R. We decided to spend it on St John Island USVI since Sharon hadn’t had the opportunity to see that beautiful island in it’s entirety. We found a small cottage on AirBNB at the last minute and booked it. It was on the south side of STJ about 4 miles outside of Cruz Bay overlooking Fish Bay and near Reef Bay. Coincidentally, some friends back on St Thomas had some of their friends from Florida visiting and they were coming to STJ on Friday to show them around and then hang out at Francis Bay for the day. They invited us to join them. This is our second time to Francis Bay. We went back in September with these same friends, who we had only recently met. This link should take you to some photos from that day – they are on our Facebook page. If you compare the first visit to this visit, look at how green it was last year and how dry this year. Only 5″ of rain since 01 Mar 15. Dry as a bone. Here are a few photos from the latest visit to Francis Bay. Our friends had not arrived yet. On Saturday, we decided to check out Coral Bay and the East End. For the record, STJ is 60% National Park and very mountainous. 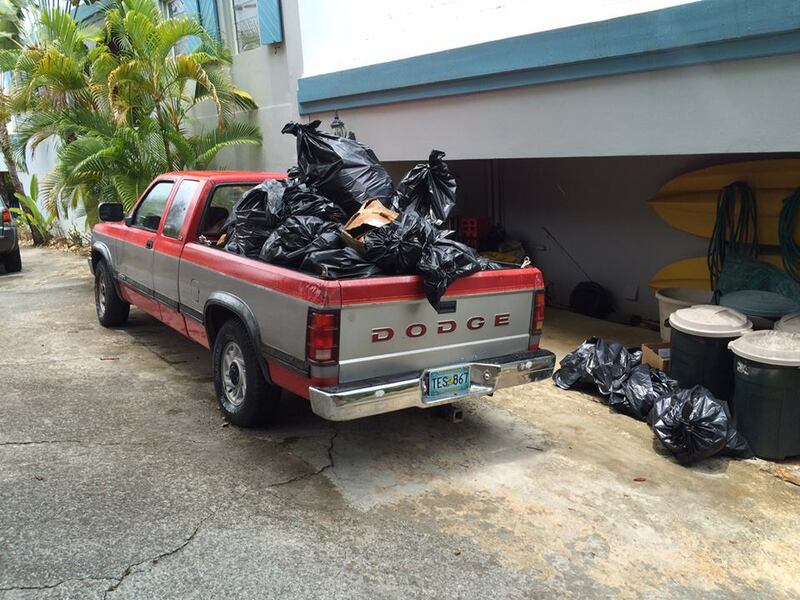 We were traveling in the villa’s 1993 Dodge Dakota – a 22 year old truck. It’s a great villa truck. But it is tired. So tired that by the time we got out to the East End and returned to Coral Bay and stopped to get some ice, the right front brake caliper over heated and froze up leaving us with a truck that would not roll. We’re looking at a bad day. Luckily, a shopkeeper contacted her local mechanic and he came right away – Jack is his name. We were able to drive the truck to his home/shop less than a mile away. It’s about noon when we get to his shop. We are not in a very populated area with conveniences like an auto parts store. Jack determines it is a frozen caliper caused by all the braking and heat over the mountains. Suggest we replace both. We agree. So what do we do for the next 4-6 hours until the parts come and Jack can fix the issue? 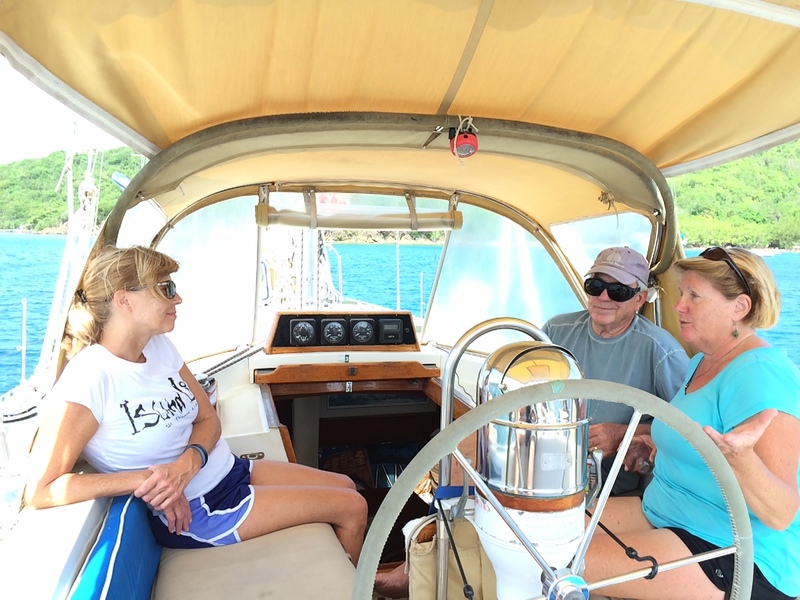 Jack volunteers to take us where we were headed – Salt Pond Bay. Jack drives us the 3.5 miles to the Bay and says just hitch a ride back when we’re done and let him know. We didn’t get any photos – we weren’t in a photo taking mood. But we did love the place and it was beautiful and interesting. There is a real salt pond there and folks haul salt out of there. In fact, Jack said he and his wife (a local catering chef in Coral Bay) brought out about 250 lbs a few weeks prior. But it isn’t easy – you probably have to walk a mile from the parking area to the salt pond. All uphill on the way out. Learn more about Salt Pond Bay here. 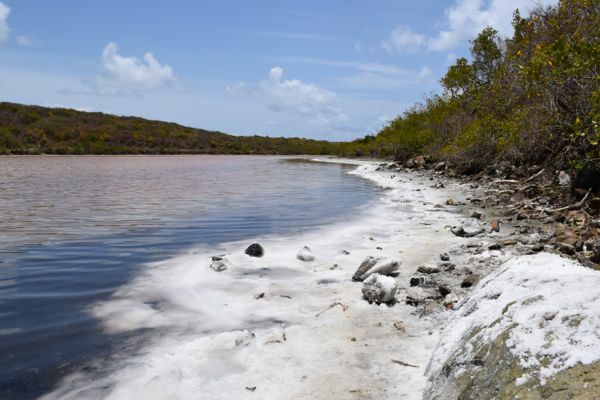 Learn more about harvesting salt at the salt pond here. We were able to hitch a ride back to Coral Bay to the bar where Jack told us to wait and call him. The bar was called Aqua Bistro – appeared to be one of the nicest places in Coral Bay. We called Jack and he said he was still waiting on the parts. About an hour later he called and said he was coming to get us. When we got into the car, he said he had bad news and worse news. Not what we wanted to hear. Bottom line, wrong parts came from St Thomas. Luckily, Jack was able to get the caliper open with some brut force and the truck was rolling fine. Jack said it may work forever or it could freeze again – but said just go easy on the brakes on the way back to Cruz Bay. Because it was a Saturday + Jack had to pay someone to go to St Thomas, the bill for his work was $230. We gladly paid to get on the road again and back to the cottage. Thank you Jack! Just another exciting day in paradise. We had some excellent food in St John, both breakfast and dinners. Best breakfast place was Jake’s; right in the middle of Cruz Bay. Hint: they are big – so share. Best dinner was Virgin Fire; a relatively new restaurant in popular Mongoose Junction complex – highly recommend. Here are a few more photos. We have a friend in AL who owns a restaurant; it’s called Jake’s, too. We sent him this photo. Loved this sign in Jake’s. Great Reggae Band. The white dude is the owner of the restaurant jamming on a Bob Marley song. He just joined on one song. This is one of their specialties – cooking on a 500° salt rock. Amazing. Shrimp, tuna, and steak. Cooked fast and it was absolutely delicious. We will try this at home. Bye-bye, St John. We will miss you. You are lovely! This entry was posted in Caretaker in the Virgin Islands, Couples Jobs, Property Caretakers, Villa in St. Thomas USVI, Visiting St John USVI on July 24, 2015 by Richard Arnold. Obviously, I’ve been a slacker as far as blogging the last month or so. But then again, the villa has been unusually busy for June and will also be busy in July which is rare. So there has not been a lot of major project work going on since I last posted. But we’ve still been having a good time and making sure we keep the villa in shape. We spent several weeks in late May getting the villa spruced up for a BIG wedding on 10 June 15. The group arrived on the 6th and stayed the week. Prior to their arrival we did some patio wall painting, some deck pressure washing, and fixed a few broken items, replaced some screens, and replaced some light bulbs. Wasn’t a lot of work but all was needed to get the villa in “Show Ready” condition. The wedding rehearsal dinner and actual wedding and reception went off without any major issues. Although, the Sunday after they arrived, we had an A/C unit go out in the owner’s apartment that had to be addressed immediately as this was to be the “get ready” room for the bride and her brides maids. They NEEDED A/C, for sure. Luckily, we were able to get our relaible A/C guy out on Sunday and he had the new unit installed and running by Tuesday afternoon. Red Alert Over! 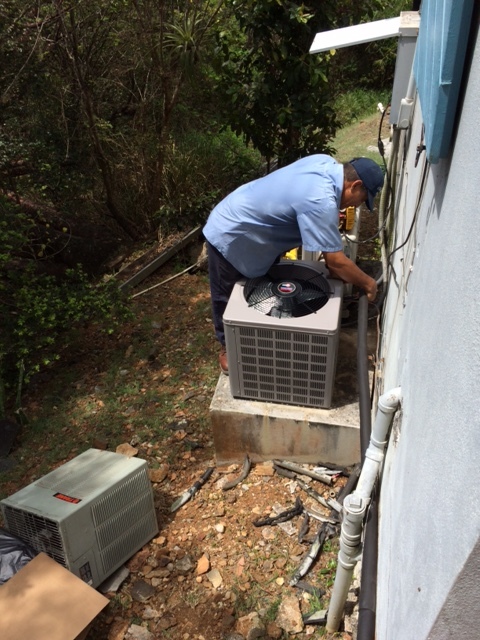 Thanks Joe with Champion AC Service on STT. One of the pleasures of living in our studio at the villa is we have a coconut tree right at the top of our stairs where we park the villa car. Since we have been here, we have made a habit of getting a young coconut and getting the sweet water out of it on a regular basis. The locals say it’s good for the ole internal plumbing system. 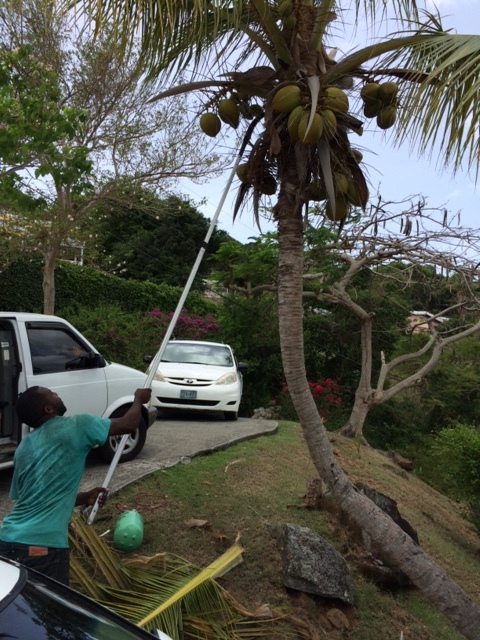 The landscaping crew comes every other week and I pointed out to them that the coconut tree needed a little trimming. So they took care of it. Once the trimming was done, the A/C guy asked if he could take some with him. The tree was loaded so of course we said “yes.” The photo is the landcscape guy trimming the tree. Looks great now. It really needed the trim. With guests in the villa most of June, it has given us a chance to do a few projects in the caretaker studio. One was the replacement of screen in the sliding doors out to our porch. These are oversized screen doors so we had to order online from a screen company in Colorado as no one had it this wide on island. 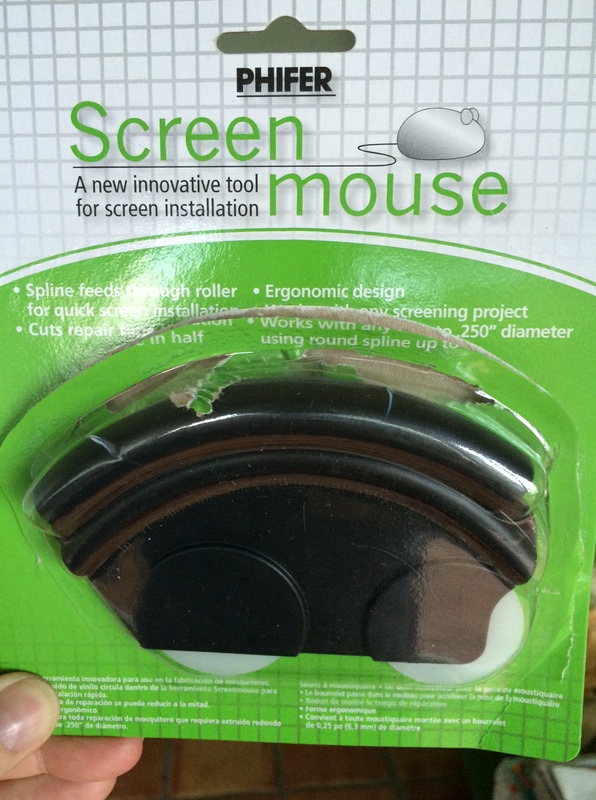 Screen Mouse tool – Must Have! No telling when theses screens were last replaced. 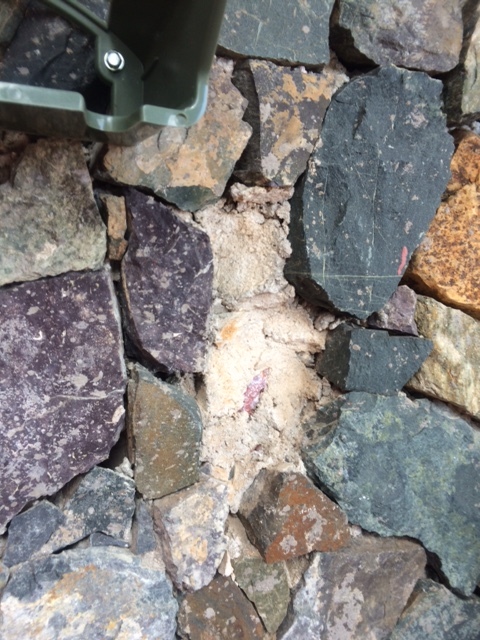 They were torn and patched in places and had come loose from the edge seal in several places. Plus, they were filthy from the Sahara dust and the cruise ship smog. Not a hard project, just takes some patience and the right tool …. the Screen Mouse. The Screen Mouse makes putting the rubber seal back into the groove a breeze. A “must have” tool here at the villa. As you can see in the background, also doing villa laundry that day. The Harts before heading off to San Blas, Panama for hurricane season. Another cool thing we did in June was go visit some friends on their sailboat as they were about to head off to San Blas, Panama for hurricane season. They have been living-aboard since about 2003 and they spend many winters in St Thomas and hurricane season in different places south – out of hurricane routes. So, before they departed they had Sharon and I out for a short visit to say good-bye. Living aboard isn’t our cup of tea but they seem to really enjoy the life on a sailboat. If you’d like to follow their travels, they have blog and the crossing to Panama was a little hairy. Read it at http://hartsatsea.typepad.com/hartsatsea/. A benefit of having guests in the villa is it allows us free time to explore and go “beaching” – one of the reasons we’re here in paradise …. right? And now that low tourist season is here, the beaches are almost deserted …. the way we like them. So, we’ve had a few great beach days in June. No complaints here – LOL. This entry was posted in Caretaker in the Virgin Islands, Couples Jobs, Minimalists, Positive Attitude, Property Caretakers, Silk Cotton Villa, St Thomas Virgin Islands, Villa in St. Thomas USVI, Working Couples Jobs on June 23, 2015 by Richard Arnold. A lot of folks grill. Folks love to BBQ. Me included. And I have always taken great care of my grills. Shoot, when we departed Blue Ridge, GA for St Thomas, I gave my neighbor my pride and joy New Braunfels Smoker Grill (with fire box) that I had had since 1996 … and it was still going strong. All it takes is a little TLC to make things last. The salt/sea environment takes its toll, too. Part of the “cleaning” duties here at the villa after guests depart is to clean the propane grill from top to bottom – have it ready for the next guests to use. When you have a villa full of guests AND they love to grill, the grill can get very nasty in a week or so. I’m not complaining, mind you. Just part of the caretaker duties and keeping the villa in “Show Ready” condition. But something happened back in the winter that caused me to do some “McGuyvering” to solve a major cleaning issue. During one stay with a full villa, I went up to let the pool guy in for his weekly cleaning. I glanced over to the uncovered grill and saw a puddle of grease under the grill. Argh! A quick inspection and I saw that the little grease cup (probably held a liquid cup) had overflowed and the guests never mentioned it to me. So I promptly cleaned up the mess. I didn’t mention it to them as they were gone – probably to the beach or something. At the end of their stay, guess what I found again? 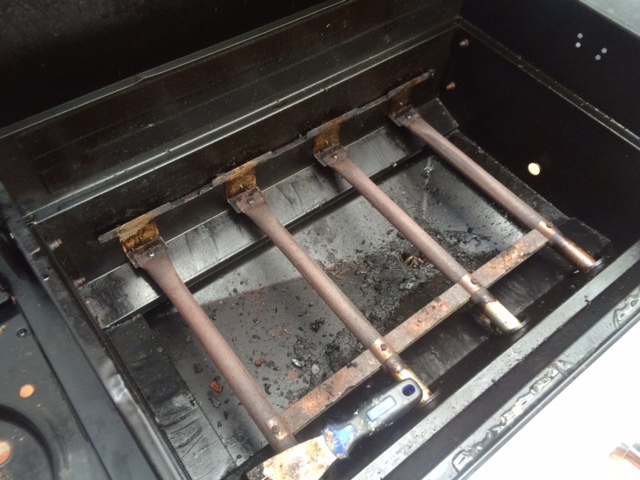 Another puddle of grease under the grill ….. BUT a much bigger puddle. ARGH again! So I had to clean that mess up …. again. So now I’m thinking, “What’s the solution? Got to come up with a solution.” Obviously I need a bigger grease cup. Think, Richard, think. Idea light bulb went off. 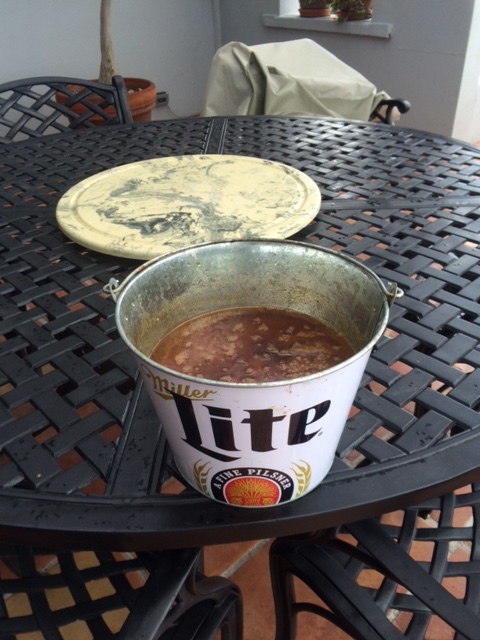 We had a Miller Lite beer bucket we obtained at a show we attended last fall at the local amphitheater. Just sitting in the closet all lonely. It got repurposed …. ASAP. I hook it to the catch tray below with a small metal carabiner – works perfect …. easy off and on for dumping and cleaning. I have to say, this is one of my better “McGuyverisms” I have come up with. Totally solved the problem. And as you can see from the photo at right, the bucket is 3/4 full of grease and this is from less than a full house of guests AND for only 5 nights. But no more messes to clean up under the grill. It’s the ultimate grease bucket! They really should make those grease cups bigger, don’t ya think? 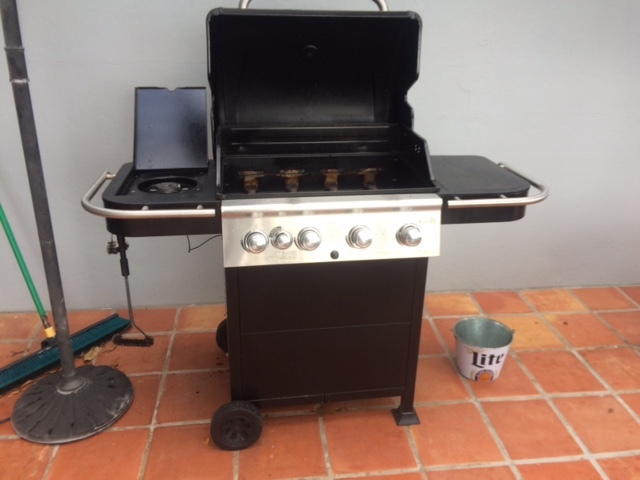 This entry was posted in Caretaker in the Virgin Islands, Grilling on May 19, 2015 by Richard Arnold. The pool at Silk Cotton Villa has been here since the original home was built sometime in the 50s. Of course, it has been resurfaced many times over the years and it was due again since the last resurfacing was about 12 years ago. The owners told us it needed resurfacing when we arrived last year and planned to have it done in 2015. Well, this big project finally rolled around. Thankfully, this project was above our pay grade and expertise level so all we had to do was some prep work and seal the villa off as best as possible to keep grinding dust out. After watching the professionals who did the job, I can honestly say I would never choose this line of work. Nasty and hard work, to say the least. It got resurfaced with Diamond Brite™ finish which is a blend of selected quartz aggregates and fortified white portland cement. The owners awarded the contract to the same fellow and company, Rick Rossie, who did the resurfacing 12 years ago. However, he has learned a lot since that time and the products have improved, too. One very valuable lesson he learned on this big job last time was to be prepared for rain during the application process. Last time he was not and it caused some issues with the final product. As you review the “work in progress” photo gallery below, you will see the big tarp that was erected to cover the entire project for protection against any possible rain storms during application. This is a big pool – about 18′ x 48′ with a big bath tub-type indention to create the deep areas. About 19,000 gallons of water. But one good design element is that you can walk all the way around the pool while in it – there is a ledge about 4 feet deep along the entire outer edge. Makes for a great poolside refreshment area anywhere along the edge. The contractor said he would have it done in less than a week and he did. They started on shedule on March 31 and were done late on the night of April 4. They did come back by on April 5 (Easter Sunday) and wrapped up the cleaning of the entire pool patio area. The contractor has some locals he uses on a regular basis but he had 3-4 big pool resurfacing jobs all in a row so he brought in some help from Tampa, FL. He has used these fellows before. Hard workers, all of them – locals and outside guys. The refinishing part started at 0700 Saturday morning and they departed about 9 pm that evening. And water was going into the pool on Saturday night. Simply amazing! 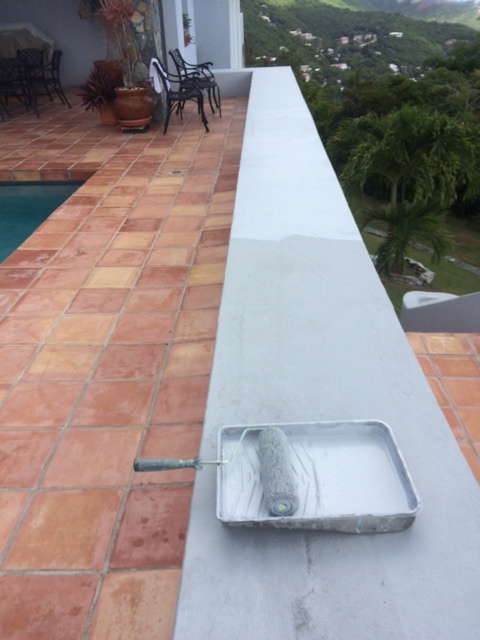 The pool is swimmable now but it has to be brushed daily with a stainless steel pool brush to make sure all the loose cement coating is removed from the Diamond Brite™ finish as it slowly cures. And who gets to brush the pool? Me. Hopefully I’m doing a good job and helping to make sure the finish stays on another 10 years or so. This project was an education for me as I had never witnessed a pool resurfacing. And it made me appreciate folks even more who have trade skills that help to keep our economy churning. Skilled trades people are tops in my book. And these guys did an outstanding job! Started draining water into grey cisterns on 30 March. Their home-made application-walking boots – brillant! This entry was posted in Caretaker in the Virgin Islands, Hire a professional, Pool resurfacing, Silk Cotton Villa, St Thomas Virgin Islands, Villa in St. Thomas USVI, Working Couples Jobs and tagged Diamond Brite™ pool finish on April 17, 2015 by Richard Arnold.